Luke Lally Maguire has been playing piano since the age of thirteen. He is a third year BMus Performance student in DIT Conservatory of Music and Drama studying under Dr. Mary Lennon. An experienced performer both in competitions and on the concert platform, Luke recently performed in the 2018 Feis Ceoil in which he participated in the Morris Grant Bursary representing the John A. Pigott Memorial Cup. 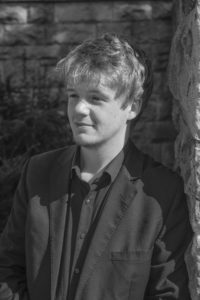 Luke also has a keen interest in accompaniment regularly performing in chamber ensembles. He won the Contemporary Irish Music Cup in the 2018 Feis Ceoil for ensemble playing. In July this year, Luke performed solo and as an accompanist at the Boyle Arts Festival. He has also performed several times in the National Concert Hall as an accompanist most recently at the Feis Ceoil Gala Concerts and at an ensembles concert organised by the DIT Conservatory of Music and Drama Keyboard Department. He has also participated in several masterclasses with Barry Douglas, Helen Krizos, Vanessa Latarche and most recently, Therese Fahy.